Visitors filled the March 2017 Greater Atlanta Coin Show in the morning hours and enjoyed the dealers' displays of numismatic and other collectible items. People visited throughout the day, but the morning bourse was packed and busy, busy, busy. Thank you to all of the people - visitors, dealers, security and hotel staff - that made this coin show a success. We appreciate all of you. We know some of our guests drive several hours to visit the show. Thank you to all of our visitors both from far away and from nearby. This month, we had a couple of dealers out with guest dealers taking their place. A special thank you to those dealers who could fill in at the last minute. We hope you had a good show and will join us again. Some of our dealers returned from the ANA National Money Show that was held in Orlando just prior to our March show. Glad you could join us, and we hope both shows were good to you. As for our weather, Mother Nature can sure change quickly in the south. Earlier in the week, our daytime temperatures rose to the high 70s. On the Sunday morning of the show, some of our dealers driving down from the north saw snow flurries in the early hours. During the show, we felt a cold day with rain in the morning tapering off for the afternoon. In the hotel, the church groups met. Plus, there was supposed to be an Indian wedding. It would have been interesting to see their guests arriving with all of their colorful clothing, but we were too busy and didn't see any of the wedding party. We had guests arrive late in the day that were surprised with empty tables. Our dealers come from all around the south, not just the local area. Several have long drives and leave early to get home to their evening plans. Yes, the show is open until 5 pm, and there will be dealers there at closing. But, to find a full bourse, visitors need to arrive at the show before mid afternoon. For this month, several people visited the show looking specifically for the US Mint's 2017 eagles. Some wanted single coins. Others wanted rolls. Now, let's take a look at a few collectibles-some oddities that can be found among the rarities. First, let's take a look at some damaged coins. In this case, the damage came from PVC. Though a wonderful product for various plumbing applications, PVC is not good for coins. "PVC is short for polyvinyl chloride, a popular and widely used plastic that has countless industrial applications. In most of these applications PVC’s qualities are completely benign. In fact, using this plastic for coin flips is OK, too. "Where the problem lies is that such storage is suitable only for the short term, say, less than six months. After that time the chemical softening agent that gives PVC its great flexibility may start to leach out. "Over time, this can settle onto a coin and deposit an oily film-that sickly, green slime that leaves an outline of the coin on the flip and adheres to the high points of the coin itself." In this example, several proof sets were stored in PVC beginning with 1969 at the top and 1972 at the bottom. In all likelihood, these coins have been in this holder for over 40 years. At the time, 1970s, PVC was not known to be bad for coins. Why didn't the collector change the storage when the problems became known? Well, the reasons could be many. If you inherit a collection and see green coins, PVC could be the culprit. But, don't try to clean the coins yourself. 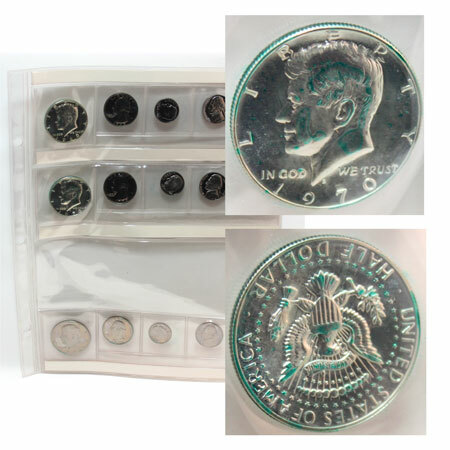 An experienced restorer with special processes can perhaps revitalize the coins. However, the layperson with household chemicals will add even more damage and take a rare coin's value down to legal tender. From green coins, let's take a look at a stickered coin. For this display, an enterprising philately (stamp) merchant decided to market a First Lady collection to include a first lady "coin." Now, the US Mint marketed real First Lady coins. They were $10 gold bullion coins containing one-half ounce of .9999 gold. The US Mint also struck First Lady medals that were distributed in Presidential Coin and First Spouse Medal sets. In this case, though, the philately merchant did not want the expense of purchasing either the gold bullion or the bronze medal to include in his product. Instead, he simply applied a sticker with the first lady's portrait on the reverse of the presidential dollar coin. 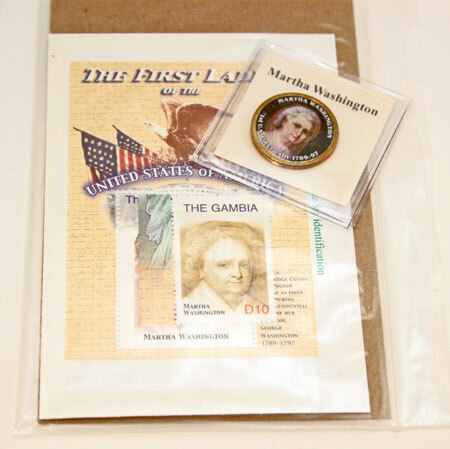 This example included Martha Washington stamps with the Martha Washington "coin," her image stuck to the reverse of a George Washington Presidential Dollar Coin. Now, just as a philatelist would cringe at a collectible stamp being glued to something, a numismatist cringes at a sticker being applied to a coin. 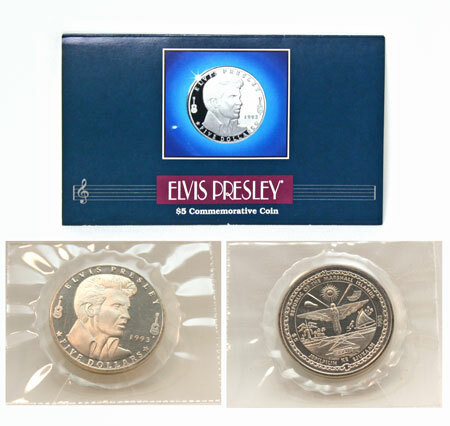 "The Elvis Presley $5 Commemorative Coin was issued by the Republic of the Marshall Islands in 1993 to honor one of the world's most celebrated and talented entertainers. "This solid-cupronickel coin is legal tender of the Republic of the Marshall Islands, which, along with the rest of the world, recognizes the extraordinary contributions Elvis made to the world of music. "The obverse of the coin pays tribute to the King and features a stunning, lifelike portrait of Elvis as a young rocker. "On the reverse of the coin is the national seal of the Marshall Islands, which appears on all its coinage. The motto, "Jepilpilin Ke Ejukaan," means "Accomplishment through Joint Effort," and the design centers on the nation's symbol, the Spirit Bird of Peace. Next, did you know there is an Elvis Presley coin? Yes, there is. It is from the Marshall Islands. "Above the Bird, the 24-point Sunstar with a diagonal line on either side represents the nation's flag and two chains of islands. The Marshall Islands, granted complete independence by the U.S. in 1986, is proud to pay homage to the man whose music is heard around the globe on the 40th anniversary of his first record." The holder also contains commentary about the life of Elvis. They included a brief overall history and made special comments about his early years. From the King, let's go back in time to recognize Lewis, Clark and Sacagawea. But, this recognition is not a US Mint product. This one is a commemorative medallion by the Northwest Territorial Mint. Their insert described the Corps of Discovery and their adventure. "Beginning from Wood River, Illinois, Lewis and Clark headed up the Missouri River to the Knife River Indian Villages near present day Washburn, North Dakota. There they spent the winter learning about the local tribes and lands to the west. They also enlisted as interpreters a Frenchman, Toussaint Charbonneau, and his young pregnant Shoshone wife, Sacagawea. "In the spring of 1805, they continued up the Missouri River to its head waters where they encountered a band of Shoshone Indians lead by Sacagawea's brother, Cameahwalt, who assisted the expedition by providing horses and guides to cross the rugged Bitterroot Mountains. After a very difficult crossing, they finally reached the Pacific Ocean in November, 1805. "The Corps of Discovery built Fort Clatsop on the south side of the Columbia River near present day Astoria, Oregon, where they spent a cold rainy winter. In the spring and summer of 1806, the expedition made their way back across the mountains, explored several major rivers and floated back down the Missouri to St. Louis, arriving September 23, 1806." The package describes the Medallion as Merlin Gold Alloy (no, I don't know what Merlin Gold is) with designs by Diane Turner and sculpting by Charles Vickers. "The Obverse features Lewis & Clark leading the Corps of Discovery along their arduous journey by water and land to the Pacific Ocean. 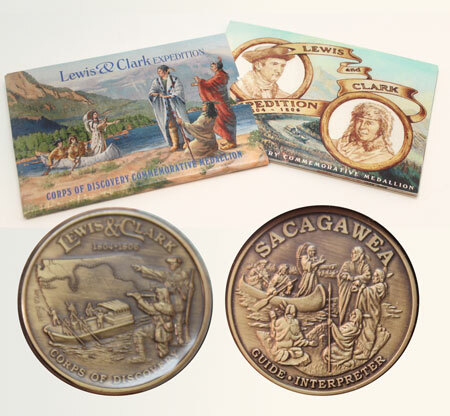 The Reverse features Sacagawea in a tribute to her critical contribution in the successful communication with the Indian Tribes during this expedition." These census numbers represent the quantity of that particular coin in that specific grade certified by NGC. In 2007, the US Mint produced 3,965,989 of each of these Presidential Dollar Coins. From the ANA Grading Guide, a Proof-69 coin "has a very attractive sharp strike and surface (mirror or other style) of the highest quality for the variety, with no more than two small non-detracting contact marks or flaws. No hairlines or scuff marks can be seen. Eye appeal is exceptional." Next, let's take a look at a complete set of the first of the Presidential Dollar Coin series. 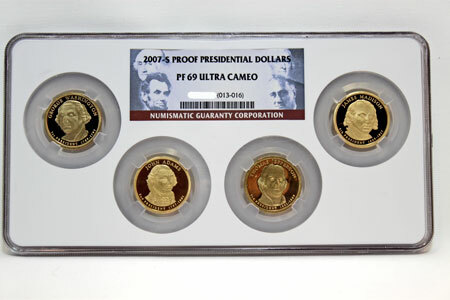 These proof coins were certified by NGC as PF-69 Ultra Cameo. Interestingly, if you search the NGC certification listing, they do not show the full set. Instead, they provide details for each coin. For example, they show for the Washington Presidential Dollar the grade and their census value of 34,945. For Adams, they show a census of 35,651. For Jefferson, 35,307 and Madison, 34,997. "Ultra Cameo" recognizes a dramatic contrast between the mirror-like field and the satin-like portrait or devices. 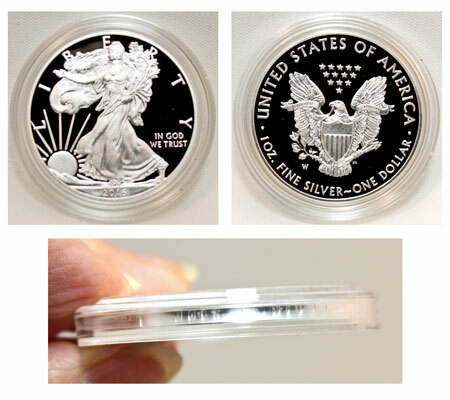 Last on our list for this month is a modern American Eagle One Ounce Silver Proof Coin. Begun in 1986, the 2016 version of the Proof Silver Eagle represented the 30th Anniversary of the silver coins. As a special tribute, the US Mint chose to add edge lettering to the silver eagle. Not the year or "In God We Trust" as they have with other coins, this coin has 30th Anniversary inscribed in its edge. The obverse remains consistent with Adolph A. Weinman's Liberty and the "dawn of a new day." The reverse shows John Mercanti's design of the heraldic eagle. 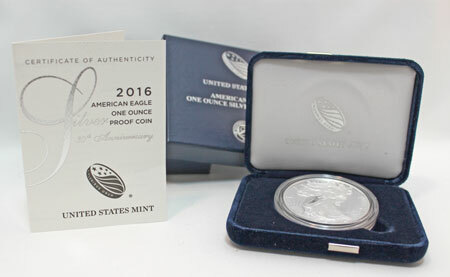 The Certificate of Authenticity includes a silver "30th Anniversary" on the front and describes the coin as Proof, 99.9% silver, .999 troy ounce of silver and minted in West Point with the "W" mint mark. The back of the certificate discusses the minting laws and describes the coin as "legal tender," however, of course, the silver dollar is worth much more than a dollar and also worth more than its silver content. The beautiful American Eagle Silver Coin continues to be prized by both collectors and investors. Join the many dealers and their displays of numismatics and collectibles at next month's Greater Atlanta Coin Show on Sunday, April 9, 2017.